You can watch a video of Dr. Rabalais' August 19 presentation here. Wednesday, August 19, 2015, 12-1 p.m. Lunch will be available from 11:30 a.m.
What are key trends in how exemplary medical schools structure the curriculum and clinical learning experiences, how technological innovation impacts teaching and learning, and how top schools evaluate their progress? What are the implications of these trends for how we teach and prepare health practitioners of the 21st century? In January 2015, Dr. Rabalais embarked on a six-month sabbatical journey to visit an array of medical schools thought to be at the forefront of innovation in medical school teaching. He visited a mixture of well-established schools, new schools, small schools and big schools, including four recipients of the 2013 AMA Awards for Acceleration of Innovation in Medical Education. Join Dr. Rabalais and your health science faculty colleagues as we together envision the future of health science education at UofL. Dr. Toni Ganzel, Dean of the School of Medicine, will introduce Dr. Rabalais. Gerard Rabalais, M.D., M.H.A., is chair of the University of Louisville Department of Pediatrics, the largest department in the School of Medicine with 200 faculty and 100 residents and fellows. He holds the Billy F. Andrews Endowed Chair in Pediatrics. Dr. Rabalais is Chief of Staff at Kosair Children’s Hospital. Dr. Rabalais joined UofL as a pediatric infectious disease specialist in 1987. He was named chief of Pediatric Infectious Diseases in 1997 and a year later, administrative vice-chairman of the department. In 2004, Dr. Rabalais was appointed acting chair of Pediatrics and was named permanent chair in December 2006. Under his leadership, the department has achieved many accomplishments. He secured new funding for a child neurology residency and started several new programs including the pediatric hospitalist program and the forensic pediatrics program. He led the effort to expand the network of UofL Pediatrics specialty satellite clinics throughout the state. He also spearheaded the opening of a multi-specialty office in East Louisville and primary care offices in Campbellsville and at the Sam Swope Kosair Charities Centre in Louisville. Dr. Rabalais serves a critical leadership role among UofL medical faculty. He helped lead the integration of faculty clinical practices into a single organization, University of Louisville Physicians and now serves as vice chair of pediatric services for UofL Physicians. This organization engaged in several major initiatives to strengthen the UofL clinical practices including implementing a new practice management system and electronic medical record, establishing single point contracting with commercial insurers and becoming a NCQA-certified physician credentialing organization for our faculty. Dr. Rabalais has just returned from a six-month sabbatical focused on innovations in medical education and faculty development. He visited eight medical schools across the U.S. thought to be at the forefront of medical education innovation and attended the Harvard Macy Institute course entitled "Leading Innovation in Healthcare and Education". 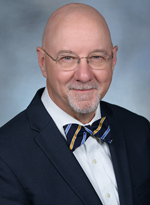 Upon his return on July 1, 2015, he will continue to serve as Chairman of the Department of Pediatrics, but will also be the Associate Dean for Faculty Development at the School of Medicine. In this new capacity, he is charged with the creation and oversight of a new comprehensive program in faculty development around making our faculty better teachers focused on helping students and residents to learn better. Dr. Rabalais is a 1981 graduate of the Louisiana State University School of Medicine. He completed his pediatrics residency and chief residency at Tulane University and went on to clinical and research fellowships in pediatric infectious disease at University of Colorado. In 1998, he earned a master’s in health administration from University of Colorado School of Business. The University of Louisville School of Medicine is accredited by the Accreditation Council for Continuing Medical Education to provide continuing medical education for physicians. The University of Louisville Office of Continuing Medical Education & Professional Development designates this educational activity for a maximum of 1.0 AMA PRA Category 1 Credit™. Physicians should only claim credit commensurate with the extent of their participation in the activity. This program has been approved by the Kentucky Board of Nursing for 1.2 Contact Hours through the University of Louisville Hospital. Provider Number 4-0068-7-16-715, expiration date July 1, 2016. The Kentucky Board of Nursing Education provider does not constitute endorsement of program content. Participants must complete the education module, post-test and course evaluation to receive contact hours. Please Note: Continuing education units are not available from the School of Dentistry for this program.